It’s not just a Melbourne burger—Andrew’s Hamburgers are THE (bolded, underlined, flashing in neon red) Melbourne burger. After 70 years, and much shameless begging from their loyal customers (read: us), Andrew’s have opened a second store in the heart of the CBD. 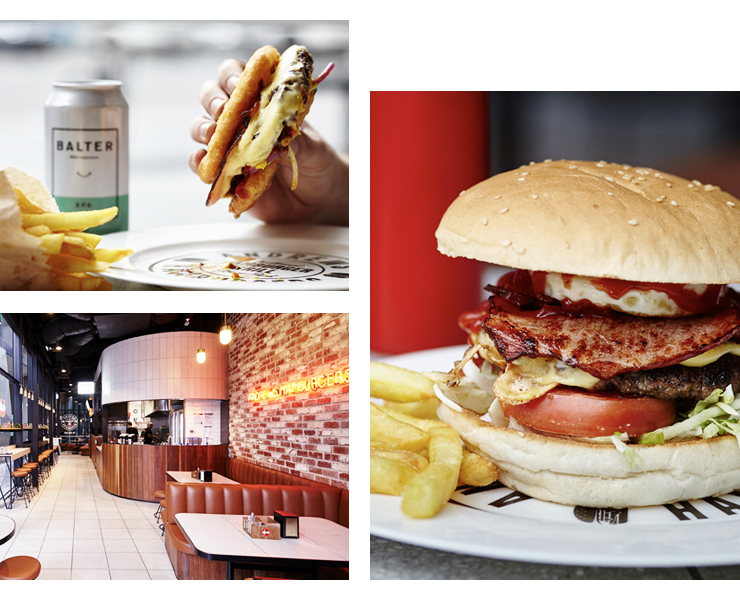 A hop away from Queen Victoria Market, Andrew’s Hamburgers has your back whether you’re looking for a post-market feed or cheeky lunchtime quickie. Traditionalists with be thrilled to hear the menu is exactly the same as the original Albert Park restaurant, down to every drop of mayo—cause you don’t mess with a bun if it ain’t broke. Traditional, no-fuss dim sims, potato cakes and golden, crunchy potato fries are all available, although burgers (predictably) take centre foodie stage. If it’s your first time, Andrew’s Burger with The Lot is a product of pure burger love. Choose from beef, chicken or steak and pair it with lettuce, cooked onions, egg, bacon, tomato, double cheese and tomato sauce. Fans of pineapple will be pleased with the appropriately-named Five O Hawaiian (it’s served with pineapple and beetroot), while the SanChez Mexican is for spice-lovers. If you’re looking for something off the menu (*hint hint nudge nudge*), ask about the secret menu. Among other burgers, The Hulk is a combination of cheese, a beef patty, bacon, onion and tomato sauce sandwiched between two golden potato cakes. Heaven is real and it’s called Andrew’s. Vegetarian-friendly options and gluten-free burgers are on offer for sensitive foodies, while the CBD venue also have a range of bottled craft beer and beer on tap. The restaurant itself is classic and understated. Deep chocolate leather booths and bar stools run along the restaurant’s length, with an open brick wall and neon sign a nod to the shop’s old-school approach. White tiling above the restaurant’s kitchen and along the floor ties the space together. Outside there are scattered patio tables and chairs for summer—with a burger in one hand and a beer in the other, there aren’t any places you’d rather be. Editor's note: This article is proudly sponsored by Andrew's Hamburgers and endorsed by The Urban List. Thank you for supporting the sponsors who make The Urban List possible. Click here for more information on our editorial policy.